For many decades, the clutch motor has been the workhorse of the sewing industry. Its reliability and torque is what made them so attractive. The most advantageous aspect of the Clutch motor is its sheer power. The Clutch motor is available in Low or High Speed, as well as 400 or 550 Watts of horsepower to meet the needs of heavier workloads and heavier materials. 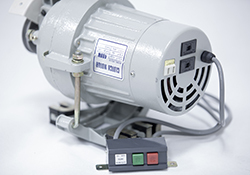 The Clutch motor is typically ideal for products that are made of heavier materials such as belts, leashes, harnesses and for other products made of thick materials like leather, and since it is faster it is ideal for high production facilities.